Bennachie Walk, Inverurie, Mither Tap, Oxen Craig, Stac Pollaidh, Oyne. 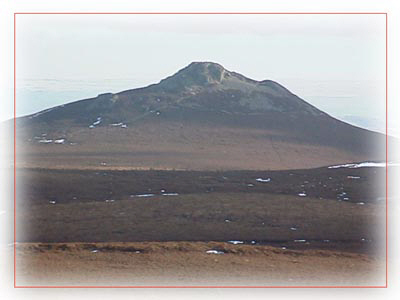 Just west of Inverurie lies the well-known hill of Bennachie, famous for the prominent granite tor known as the Mither Tap. The hill is really a series of tops along a sprawling five kilometre ridge and although Oxen Craig is the highest point at 528 metres, the Mither tap is without doubt its crowning glory. The Mither Tap is a tor, composed of a coarse granite and red felspar. In addition, a vitrefied fort with walls about 15 feet thick runs round the bottom of the tor nearly 100 feet below the summit. Inside this, there is a second concentric wall to explore. 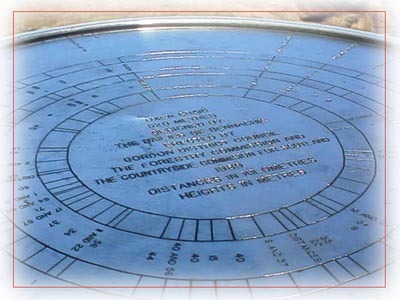 Bennachie is a place with much to recommend it. Driving up from the south, the Mither Tap does a very good job of impersonating a profiled Stac Pollaidh. It's best to tackle this hill from the north, avoiding the commercial intrusion of the Bennachie visitors centre. Travelling along the B9002, follow the signs leading to the Back of Bennachie car park, just west of Oyne. Car parking is plentiful and there is also an information board giving details of the various forest walks in the area. The summit trail is marked with orange pointers so navigation on this hill is unlikely to be much of a problem even for the most inexperienced hiker. The track sets off through the woods and climbs steadily alongside a delightful bubbling brook. After 10 minutes or so you leave the forest and the path strikes up the steep heathery slopes towards Little Oxen Craig. You can either make the short detour to visit the old quarry on Little Oxen Craig on the way up or do as I did and save it for the return leg. 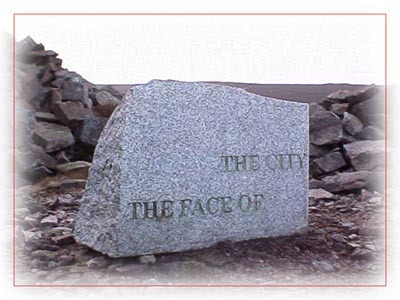 Whichever way you do it, make sure to drop down from the summit and seek out the strange granite block which reads ''The City .. The Face Of''. Answers on a postcard please! The excellent path towards Oxen Craig allows you to make good time and, despite some very hard and slippy snow patches on its upper reaches, I was reading the summit indicator within half an hour of leaving my car. There is also a summit cairn to complement the indicator but with the Mither Tap beckoning some two kilometres distant you probably won't want to hang around here too long. An obvious tracks leads off across the plateau in an easterly direction towards the enticing edifice which, at 518 metres, is just 10 metres shy of its bigger sister. The large fort which is found on the eastern face of the tor is hugely significant in terms of the area's history. At around the start of the first millennium AD the Romans forced their way north into this part of the country. Evidence of the Roman presence in the area was found in 1975 at Logie Durno when a 140 acre camp was discovered. It is possible that the local people sought refuge behind the fortifications of the Mither Tap but it would not be unreasonable to suppose that the superior technology of the invader would have eventually overcome the stone built defensive structure. It has been suggested that the northern slopes of Bennachie was the Mons Graupius, where the Britons were crushingly defeated by the Roman legions, and that the name is the root of the modern term for the region - "Grampian". Give yourself plenty of time to explore the windswept summit before setting off for the day's next peak. 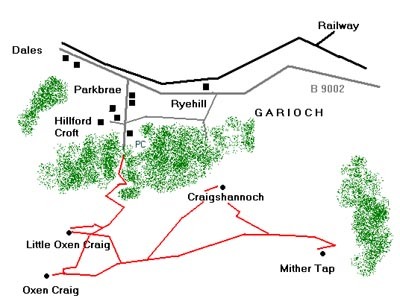 Craigshannoch lies to the northwest and is reached by retracing your steps from the Mither Tap and following the obvious path. The route passes under a busy flight path and you will likely hear air traffic throttling down on their approaches to Dyce even if low cloud means that you don't see them. From Craigshannoch rejoin the track for Oxen Craig and bear right at a junction which leads you to the main track just above Little Oxen Craig and the way home. Map OS Landranger 1:50,000 sheet 38. Start/parking Back of Bennachie car park off the B9002. Grading Steep initial climb is fairly tough but means that the hard work is done early in the day allowing you to enjoy a delightful ridge traverse. Good paths but this is an exposed area and can be very, very windy on the summits. Suitable for fit walkers with a head for heights.